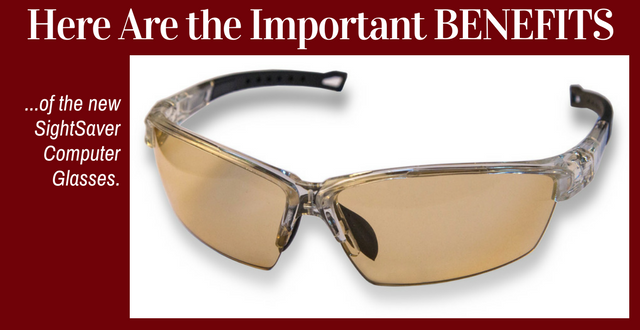 Why are these new SightSaver Computer Glasses the state-of-the-art professional protection your eyes need? These lenses are infused with a scientifically proven, proprietary synthetic melanin called Melaneye. (Synthetic melanin was first created in the labs of the Yale Medical Research Center.) We’ve already learned that (1) natural melanin is the body’s protection against harmful rays, (2) it's found not just in our skin but also in the retina of our eyes, and (3) we cumulatively lose the melanin in our eyes as we age. As it is lost, it cannot be replaced – but we can compensate by using lenses with synthetic melanin infused into them. The Melaneye synthetic melanin that's infused into SightSaver lenses is what sets them apart from ordinary colored computer glasses. Not only does it protect our eyes, but many people report that the Melaneye synthetic melanin actually increases their visual acuity – making things look sharper and clearer when wearing their SightSaver Computer Glasses. 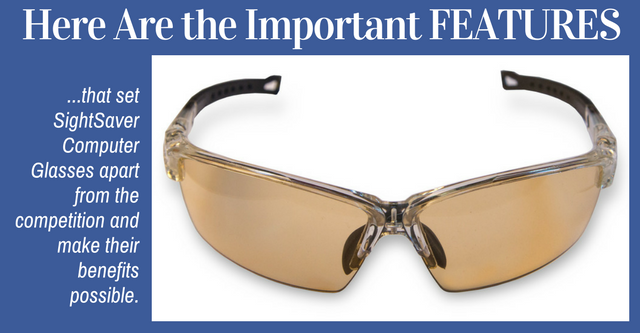 Melaneye protection from the damaging and harmful HEV rays. Retarding and compensating for natural melanin loss caused by these rays. Addressing the issue of melanin loss from overexposure and addiction to digital devices with screens (e.g., computer screens, tablets, smart phones, gaming devices, etc.). Enhanced visual acuity, providing better definition and contrast. A prescription lenses capability – preserving melanin benefits and those of a wrap-around style of lenses and frame. Our proprietary, synthetic melanin – Melaneye – infused into the lenses. The wrap-around frame style reduces unfiltered light. Frames are made from TR-90, a superior material used for many of the designer, brand-name, high-end eyewear costing $200-$300 and more. Smaller, detachable inner frame to accommodate prescription lenses. This is a MUCH better solution than clunky clip-on glasses. A microfiber bag to hold your eyewear that can double as a cleaning cloth. A handsome eyewear case with the SightSaver Computer Glasses logo on it.